Case Studies, Projects - ElecComm Corp. Inc. 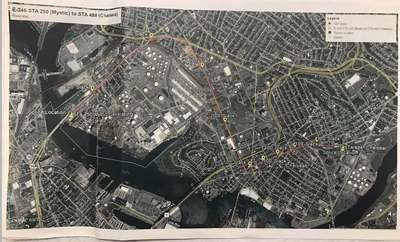 In 2017, ElecComm was awarded a lump sum bid for Cape Ann (Gloucester, MA) 2325 Cable Replacement UG Project. ECC Installed approximately 16 miles of 3-1000kcmil CU EPR 35kV cable. The cable was predominantly installed in an existing manhole and duct system. Cable replacement was completed a in a phased approach in order to meet the schedule of the MBTA. Phase I was the West Gloucester #28 to Gloucester #24 section. Phase II, the larger portion, was East Beverly #51 to West Gloucester #28 section. In addition to cable installation, ECC installed Vacuum Switches, removed switches, removed cable and spliced and tested the cable end to end prior to placing the line in service. This is the second line ECC installed, the first same exact run was completed by ElecComm back in 2012/2013 and included work in Manchester, MA. Parallel runs. Manchester, MA was more complex with OFC removals and congested MH’s. In June 2017, ElecComm was awarded the Pelham Substation Feeder Getaways Project. The 14L1 and L3 distribution feeders will exit the Pelham Substation underground from the 13.2 kV Bus #1 to MH#3 (approximately 200 FT) located outside the substation fence near Main Street. The 14L2 and L4 will exit Pelham Substation underground from the 13.2 kV Bus #2 to MH#2 (approximately 200 FT) also located outside the substation fence near Main Street. The 14L1 feeder will continue westerly, from MH#3 approximately 390 feet to MH#4. From MH#4, the 14L1 feeder will continue westerly approximately 70 feet to riser pole 17. The 14L3 feeder will continue easterly from MH#3 approximately 20 FT to MH#2. From MH#2, the 14L3 will continue approximately 50 feet to riser pole 23. The 14L4 feeder will continue northerly, from MH#2, approximately 40 feet to riser pole 22. The 14L2 feeder will continue westerly from MH#2 to MH#3 for approximately 20 FT. From MH#3, the 14L2 feeder will continue northerly for approximately 60 feet to riser pole 21-50. This project was completed in 3 weeks with a 4-man cable crew and a 2-man splice team. The work performed on this project consisted of building new manholes with racks, arms, ground ring-bus, cable installation, splicing and terminations. ECC was responsible for performing the cutovers to energize the new feeder getaways from the substation to the new riser poles. In December 2016, ElecComm was awarded the Station 250 (Mystic) to Station 488 (Chelsea) Project from Eversource (NSTAR Electric). 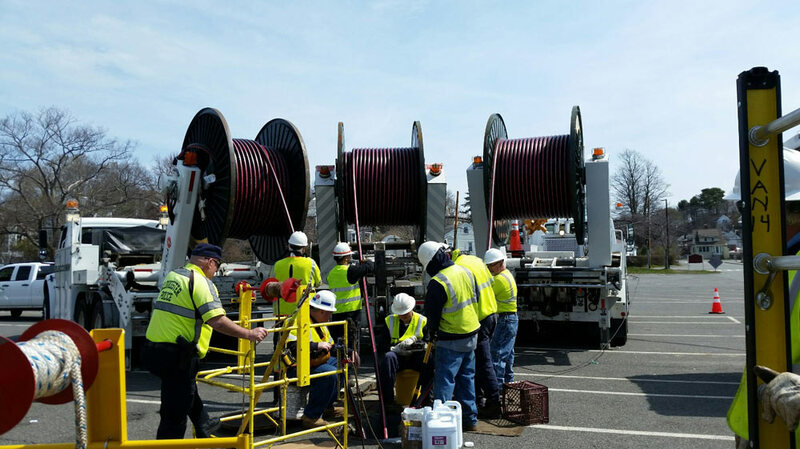 The scope for this project covers the installation of fiber optic cable, fiber splicing and fiber optic cable testing between Mystic Generating Station #250 and Chelsea Station #488. The fiber optic cable was to be installed through existing Eversource underground facilities. The distance between Mystic Generating Station #250 and Chelsea Station #488 is approximately 18,000ft (3.4 miles) not including slack cable. Phase 1 of this project was to Rod & Rope and proof conduits from station to station through 60 Eversource Manholes. Phase 2 of the project was to install 18,000’ of 1.25’ smooth wall innerduct from station to station. Phase 3 covered the installation of 48-count fiber optic cable from the #250 station communication rack to the #488 station communication rack. For the 18,000’ stretch, 100’ slack coils were left in 10 Manholes for future splicing. 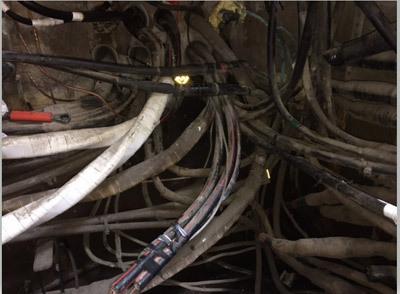 Phase 4 involved the 48-count fusion splicing in 2 Manholes outside of the stations and also in the 48 count patch panels in the communication racks in the stations. Bi-directional testing was performed from station to station at multiple wave lengths. The 5th and final phase was to fire tape innerduct in all manholes, tag & rack to MH walls and firebrick conduit ends. ECC completed this project in 4 weeks utilizing a 4-man cable crew and a 2-man splice team. 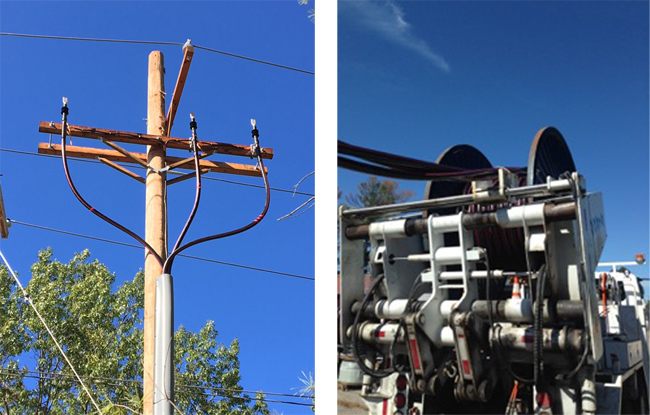 ElecComm has supported storm restoration efforts for Eversource, National Grid, Liberty Utilities & Unitil. ECC responds to 911 and wire down calls to protect the public and restore power to customers. The utilities have utilized ECC on all types of storms ranging from Ice Storms to High Wind and Rain. ECC provides the service of 24-7 storm restoration crews. The average storm can range from 1 day to weeks on end, working 16-18 hour shifts 7 days a week until all customers have been restored and released by the utility. The work performed by ECC during storm restoration is the installation and repair of secondary wires for commercial and residential customers up to 600V. Our storm response crews will go into customers homes or businesses to verify proper voltage, rotation and safety for the customer. In October 2017, ElecComm started a street light repair project for Eversource in Springfield, MA. The timeline for this project was 2 months and ECC was able to repair 65 street lights. 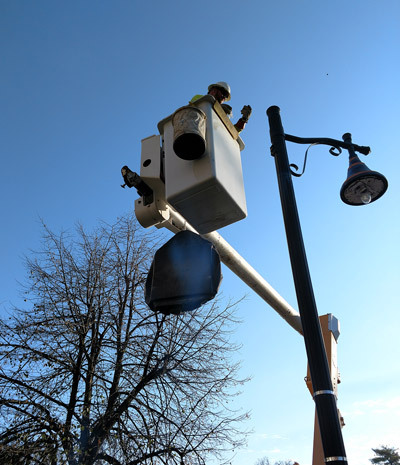 The project scope was replacing wooden, aluminum and ornamental street lights. The tasks involved were trouble shooting UG feeds from Manholes, Handholes or direct buried cable, while replacing or repairing them from the source. This consisted of replacing secondary crabs and cable feeds in Manholes, Handholes as well as direct buried faults. In addition to these repairs ECC was tasked with replacing or repairing faulty lamps, photo cells or a complete switch out of the existing head. In March 2016, Eversource Electric awarded a Not to Exceed project to ElecComm to build 12 new feeders on their Connecticut Grid. The work was started in September of 2017 and the estimated completion date is January 2018. The project was to upgrade 12 feeders in the Stanford, CT area. The crews installed 15,000ft of 750 15kV cable, completed 100 15kV straight splices, completed 275 T-Body’s and installed 24 terminations at station reactors. Upon installation ECC crews were responsible for energizing the new feeders and de-energizing and cutting off the old feeders at stations. To perform this task ECC had to TIMCO and ID 12,000’ of existing cable prior to removing it.